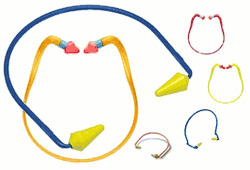 Ideal for shooting and other intermittent noise situations, Banded Ear Plugs, also known as Hearing Bands or Ear Bands, are a unique solution to hearing protection: cooler than ear muffs, more convenient than ear plugs, and always handy when you need them. Banded Earplugs are exactly what they sound like: ear plugs mounted on a plastic headband. Always convenient, the band helps to keep the plugs in place for a better, more effective fit every time. The band also helps with visibility. Never lose your ear plugs again! Check here for Banded Ear Plug Replacement Tips. (NRR 17) Weighing in at just 10 grams, the Tasco T-100 is one of the lightest banded earplugs currently available today. This is made possible by employing a unique "memory" hollow band, which retains its shape well and won't bore in. Designed to be worn under the chin. (NRR 18) Elvex GelPods Banded Ear Plugs feature gel tips made of a unique composite that is three times softer than ordinary industrial reusable ear plugs. (NRR 23) Elvex GelCaps Banded Ear Plugs feature gel tips made of a unique composite that is three times softer than ordinary industrial reusable ear plugs. (NRR 22) Tasco Contra-Band Banded Ear Plugs feature a tapered bell shaped tip and ultra-light weight for all day comfort. The tips are washable and replaceable for lasting value. (NRR 22) Moldex Rock Bands have two flexible arms that distribute pressure evenly and soft reusable pods that gently cap off the ear canal, for a more comfortable hearing band. NOTE: Band color is randomly chosen. Sorry, but we cannot offer a color selection. (NRR 25) Moldex Jazz Bands banded hearing protectors are ideal for intermittent usage. The high NRR and the low pressure on the ear make Jazz Bands an excellent choice for all applications.